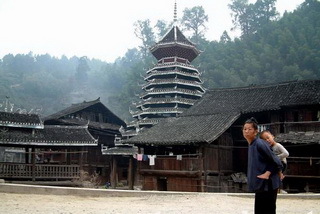 Zhaoxing is the home to Dongs (one of minorities in China) who are talented architects for wooden structures. These people are also good dancers and singer. 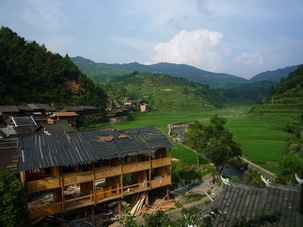 The town is located in Liping County, southeast of Guizhou province and one of the biggest Dong villages. Zhaoxing is surrounded by mountains and built in basin, which consists of 5 villages (Ren, Yi, Li, Zhi and Xin). 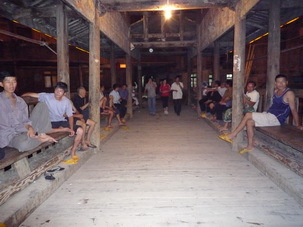 The population is around 4000 with about 800 families. It is quite a surprise to find that after centuries of existence, it is still preserved as its original appearance. 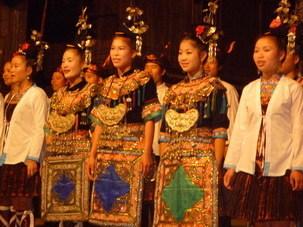 Right here you can also have a chance to enjoy the Dong music and their folk songs. Their favorite musical instrument is called Lusheng, a reed-pipe wind instrument. The Dongs have never had a writing language until the year 1958. And so before that the Dong culture, the Dong stories and history were recoded, really, by means of song. That's not literally recorded on cassette, but passed down from generation to generation. It's really a kind of Dong literature, an unwritten literature. In addition, Dong music has traditionally been used to negotiate social and individual events. For example, they have music for farming in the fields, music for offering wine to a guest and music for dating.